Still be worrying about so many passwords to remember? 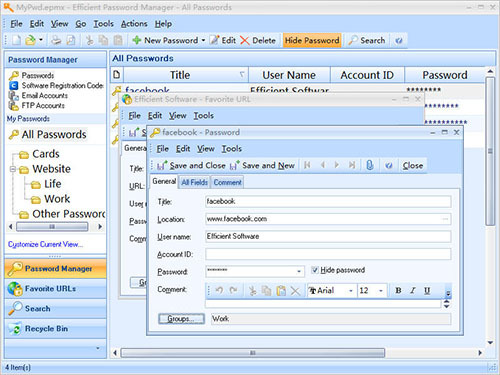 Now we have Efficient Password Manager Pro, a powerful and cross-platform password management package. She can not only help you remember general password information, but also record website login passwords, software registration codes, e-mail account passwords, or even passwords for your FTP accounts, etc. A random password generator is integrated which saves your time meditating for passwords. Actually, the passwords generated by this tool are usually safer. Your private information is fully protected – the main login password is encrypted by the irreversible SHA algorithm, while the password information itself is encrypted by 256-bit AES algorithm, the encryption strength of which is among the highest in the world. 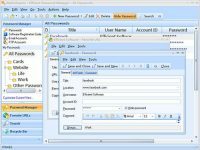 The software also offers many special features such as password management in hierarchical grouping, adding attachments to password entry, setting record importance, displaying record list in card view. The interface of the software looks fashionable and cute. It has up to 10 interface styles of different tones of color for you to choose from! With Efficient Password Manager Pro, you only need to remember one password! And you can sync data across PCs and mobile phones.